A U.S. magistrate judge on Tuesday ordered Apple to comply with FBI requests to help extract data from an iPhone owned by one of the shooters involved in December's terrorist attack in San Bernardino, Calif.
Judge Sheri Pym informed Apple that it must provide specialized software that will allow law enforcement officials to thwart iPhone's built-in security measures, specifically a feature that automatically erases handset data after a certain number of unsuccessful login attempts, the Associated Press reports (via ABC News). It is unclear whether the iPhone in question is running iOS 8 or iOS 9, both of which feature so-called "strong encryption" that even Apple can't break. The report is also vague on the level to which Apple must participate. From the AP's wording, it appears Apple could be forced to hand over a software package that might be copied and later applied to similarly locked devices, undermining the company's encryption efforts. Today's ruling comes less than a week after FBI director James Comey said law enforcement technicians have attempted, but so far failed, to access information stored on an iPhone owned by the county, but used by Syed Rizwan Farook. Farook and his wife Tashfeen Malik fatally shot 14 people in a terrorist attack last year before being killed in an ensuing police shootout. "We still have one of those killers' phones that we haven't been able to open," Comey said at a hearing of the Senate Intelligence Committee last week. "It has been two months now and we are still working on it." The iPhone model in question has yet to be identified, but Apple's iOS operating system has for years provided password-based and remote data wipe options as part of its security suite. The ability to erase phone data is just one facet of a comprehensive encryption system built to secure a highly sensitive personal information, including passwords, contacts, biometric data, financial data and more. 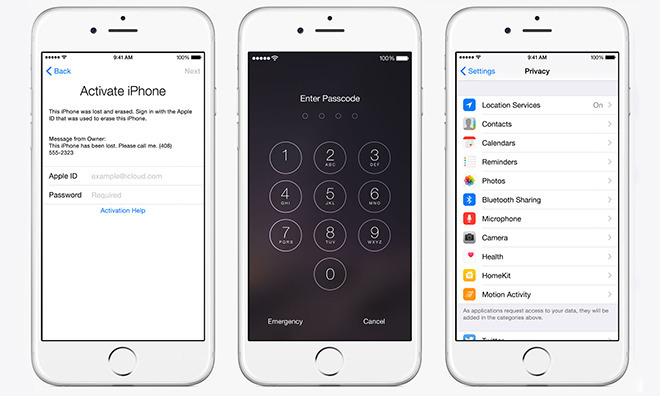 Apple took an extra step with end-to-end encryption in iOS 8, a protocol the company claims even it can't break. Update: The Washington Post adds detail to today's court order, saying the phone in question is running Apple's latest iOS 9 operating system. Once the auto-wipe feature is deactivated, technicians can conduct a brute force attack to unlock the code, but it is not clear that Apple is capable of such a feat.